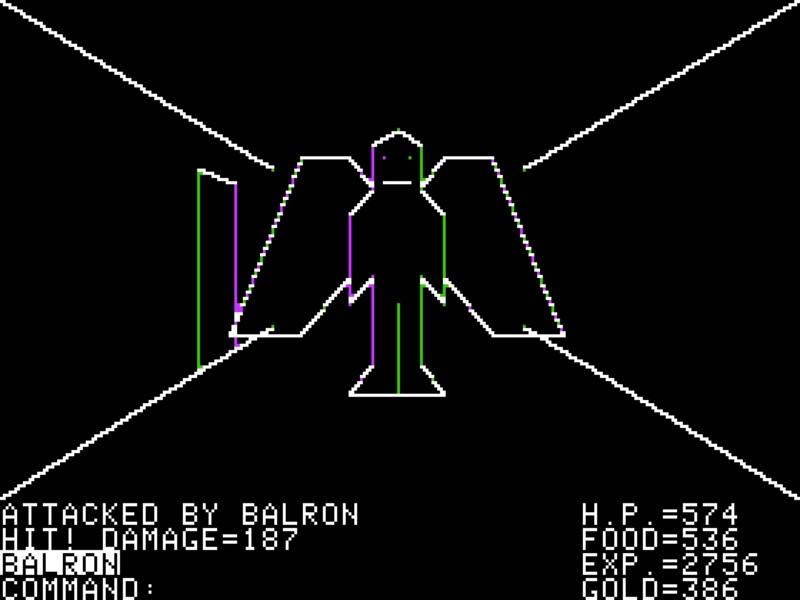 Ultima was the first real professionally released RPG from Richard Garriott, and it shows. He threw in everything his young computer geek self thought fun, so anything went! 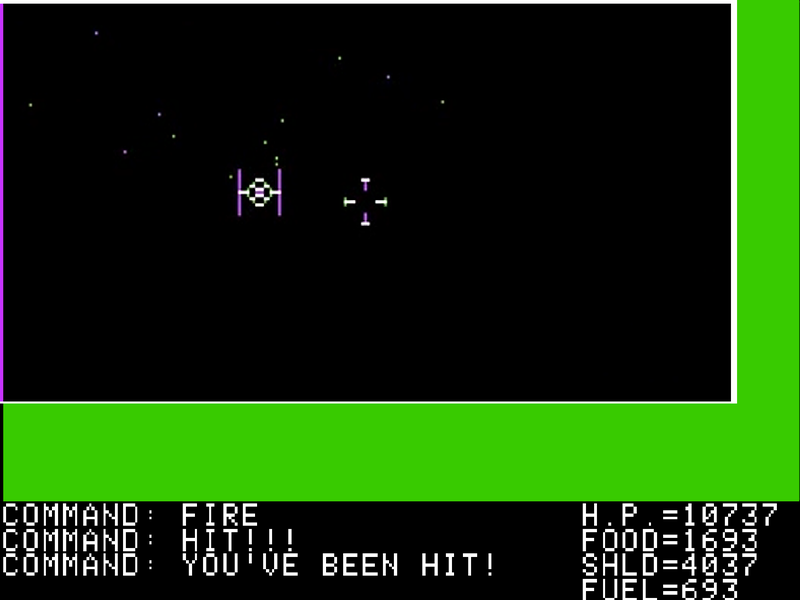 Combining a huge, colorful and innovative overworld map, the randomly generated wireframe dungeons from Akalabeth and an incredibly frustrating space battles – similar to the Atari 8-bit game, Star Raiders – Ultima gave players many fun and interesting things to do, and it’s easy too see why it was so successful. As the game begins, the four continents of Sosaria have already been conquered by the evil wizard Mondain, who used the Gem of Immortality to become invincible. Your only chance them is to collect four magic gems to power a time machine to go back in time and slain the wizard before he gains his powers. You can basically explore the world as you want because of how loosely intertwined the game’s solution and mechanics are. Which is good, as at its core Ultima takes about 2-5 hours to complete, if you know what you are doing. Most of that time is spent gaining enough gold to buy food and supplies to survive, along with getting enough experience points from killing monsters in order to qualify to acquire the time machine and complete the game. This is all XP is good for, character levels are otherwise irrelevant in this game. Hit Points are gained through killing monsters inside of dungeons and then escaping, or by giving money to one of the eight kings that inhabit the world (one of which is the famous Lord British, Garriott’s alter-ego). Attribute scores are improved by locating and interacting with sign posts spread throughout the world, with bonus points rewarded for going to these sign posts as a quest for four of the kings. Doing quests for the other kings involves killing monsters in the dungeons you would go into anyway, and you can also try to rescue captive princess from castles. Combat itself is very similar to Akalabeth, but you have a time limit to act, or you’ll lose your turn. 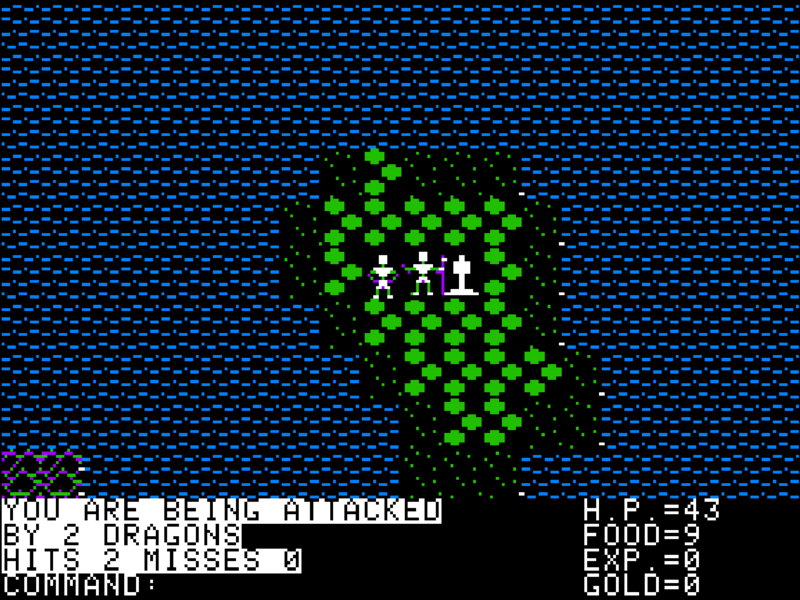 And now there are random enemies encounters on the overworld map as well, not only inside dungeons. 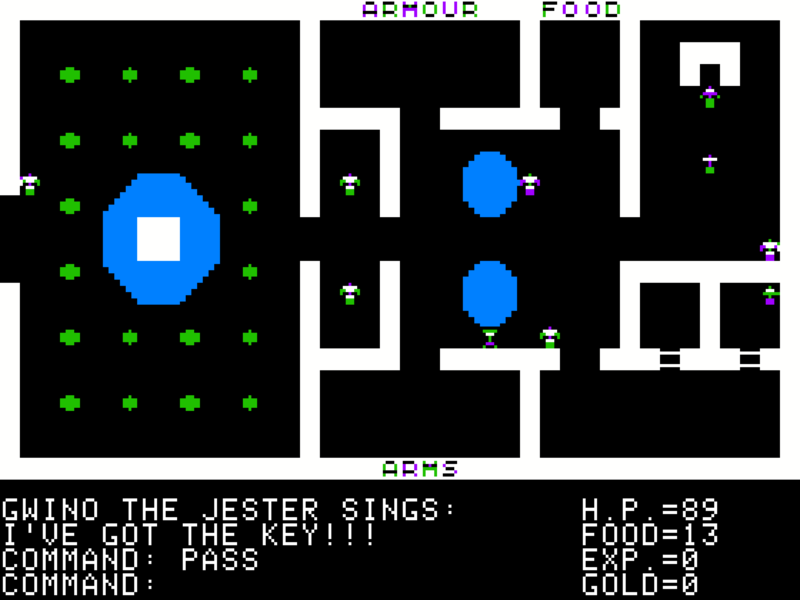 Towns and castles are one-screen areas where most of the game’s solution are uncovered via jesters talking out loud, or by spending money in bars. Items and food can be bought or stolen, with the chances of very tough and angry guards homing in on a caught offender’s position. As the player progresses, the technology of the world advances, and various new weapons and armors begin showing up in the stores, going from swords and bows to pistols, energy swords and even a “phazor”. That also includes vehicles, such as a hovercraft with lasers and a space shuttle (again, anything went!). Ultima allows you to play a Human, Elf, Dwarf or “Bobbit”, as either a Fighter, Cleric, Rogue or Wizard. Those mostly just change your initial attributes, as anyone can use any equipment, but only the Wizard can cast some of the spells. The magic system is quite simple, with only a few different spells available in towns as one-cast scrolls. And really, only two are useful: Ladders Up & Down. Those aid in making the dungeons somewhat light and semi-optional, as they allow one to avoid having to seriously map or look for secret doors in any of the many dungeons. For a new RPG player this makes Ultima a great first taste of the grand-fathers of the genre, especially for one who isn’t heavily invested in complicated games. You can read the gorgeous manual illustrated by Denis Loubet to make you feel as if you’re a part of this world, and then the Command Summary Card to learn the few keystrokes required to play. Ultima was my first real RPG experience. While I had some understanding of this sort of thing thanks to the Endless Quest and Choose your Own Adventure books, this game was like nothing my 13 year-old mind had experienced back in 1988 on my new Commodore 64. It taught me keyboard layouts and how these “RPG things” worked. To look for clues. To explore a world with much of its flavor in the manual’s wonderful text and artwork. To BE in an adventure, as opposed to just watching the animated Hobbit film. This game took me a good month to complete – with only a single call to Origin’s hint line towards the end game – in those days before game solutions were easily available.